Due to the internal sync bus of the Spectrum boards the construction of synchronous multi channel systems with free definable trigger channels is no problem. However: often a standard system with normally three to five PCI or PCI Express slots has not enough space. For this Spectrum offers a series of individual complete systems based on 19" components. Extension is possible, our 19" systems being based on the newest backplanes with PCI Express technology and fastest throughput. 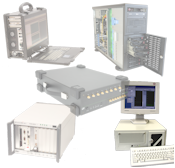 We can offer 19" systems with up to 20 free PCI Express or PCI-X slots. Besides our measurement products this offers enough space for further functionality like Ethernet, DSP, GPIB interface and much more. Using boards in this high-end area will produce a lot of heat. A system with 128 channels running at 1 MS/s sampling rate (16 pieces of M2i.4642-Exp) will produce power dissipation of more than 300 watts. To manage these values, robust industrial systems are equipped with suitable power supplies and powerful cooling fans. Years of knowledge in setting up high-speed streaming systems make Spectrum to the preferred partner to get complete streaming solutions. We know which motherboard, memory, CPU, RAID controller and hard disk technology to select to reach your required performance. Don’t waste days by trying to get an unfeasible PC to perform as you need. Ordering a full streaming system from Spectrum will give a defined streaming performance through carefully selected hardware together with an optimised software. A continuous hard disk streaming rate of 200 MByte/s from one card or several hundred MByte/s from multiple cards is at your hands.